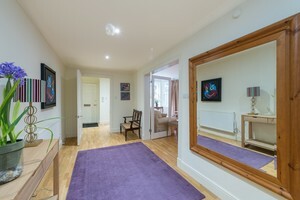 A spacious self-catering apartment in Edinburgh's West End. Within easy reach of the city’s shops, attractions, bars and restaurants. 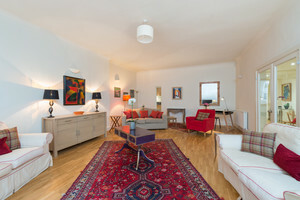 This stunning two-bedroom Edinburgh West End holiday rental is ideal for groups and families of 4 to 6 people. 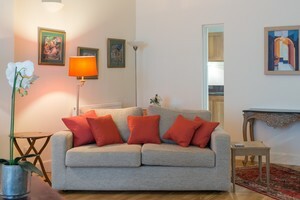 The apartment is immaculately presented with contemporary furnishings. What's more, it's centrally located in the West End of Edinburgh, a vibrant and upmarket area of the city. There are plenty of boutique shops and restaurants close by, and many of the city's main tourist attractions are within walking distance. 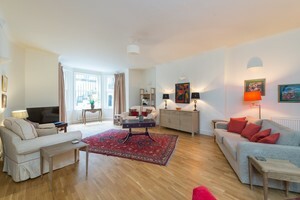 Easily accessible, the property is close to Haymarket Train Station and major bus routes. Plus, the tram line provides a direct link from Edinburgh Airport. 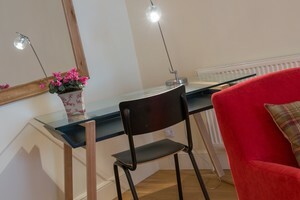 This Edinburgh West End holiday rental has 1 king room and 1 double room. There is also a double sofa bed in the lounge. So, it would be perfect for families and groups of 4 to 6 people. 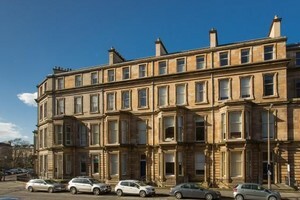 This apartment is in a beautiful Victorian building on Drumsheugh Gardens, in Edinburgh’s West End. The generous lounge provides plenty of space for guests to unwind, and has doors which open onto a fully equipped contemporary kitchen. A spacious hallway provides a grand dining area, great for both family meals and entertaining with friends. 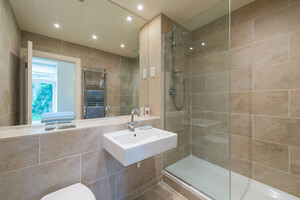 As well as the ensuite bathroom, a family bathroom is available. 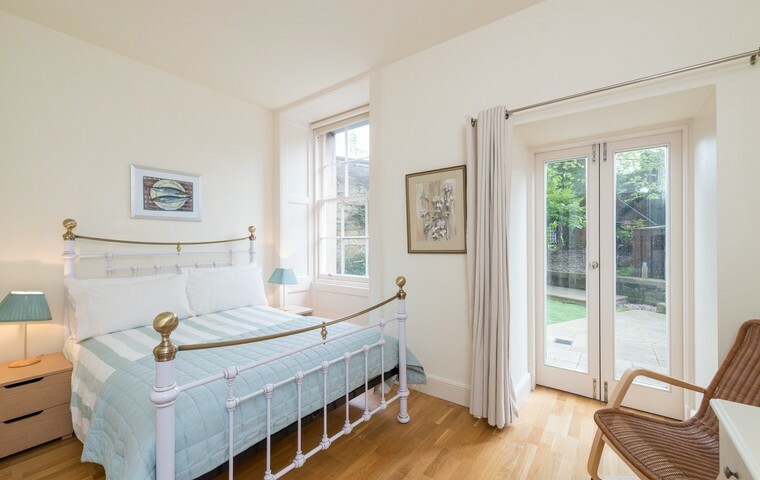 Both of the spacious double bedrooms have direct access to a private garden, providing a lovely area to sit out and relax during the warmer months. 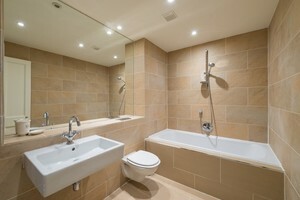 One of the bedrooms has a smart ensuite shower room, and both are decorated to the highest standard. 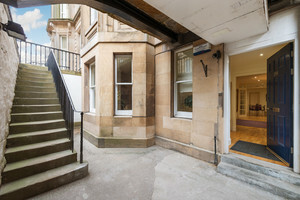 The property is located in the West End of Edinburgh city centre. You can easily get there by tram from Edinburgh Airport, getting off at West End Princes Street stop. Or, by any bus or train going to Haymarket. Parking notes As this is a city centre property, roadside car parking is restricted. There is meter parking available on-street outside the property. Or, there is an NCP car park 5 - 10 minutes walk away at Castle Terrace, providing 24 hour parking. 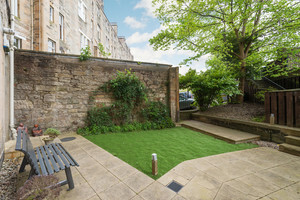 Local area Drumsheugh Gardens is in the stylish West End of Edinburgh, close to lots of wonderful independent shops, boutiques, cafes, bars and restaurants. It is incredibly central. Just 10 minutes' walk to Edinburgh's main shopping streets, Princes Street and George Street, and around 15 minutes walk to the Royal Mile and Edinburgh Castle. You can easily access trains, trams and buses too. So, this is an ideal location for those wishing to walk or use public transport. Very happy with our stay at this property. Beautifully furnished, impeccably clean, and top rate (in person) service from Magda, who greets you upon arrival. Television has hundreds of channels, including all American sports (I could watch NFL Redzone!). Great, central location near pubs, excellent restaurants (try the French restaurant a block down). Highest recommendation. I can't rate Let's Get Local highly enough, we had an urgent need for an apartment and Lorna was so kind and helpful and arranged for the perfect place for us. 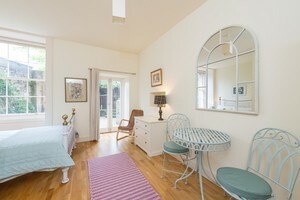 The property was ideal, perfect location, very reasonable, chic and immaculate! Lorna catered to all our needs with charm and enthusiasm - I would recommend Let's Get Local full heartedly. Exceeded expectations! This property was incredible value and exactly what we wanted. Great communication from start to finish and everything has been thought of when it comes to the properties. Manuals, personal meeting on entry, local area guides etc. Great location and spotlessly clean, spacious and comfortable accommodation. Lovely, well equipped, comfortable apartment. Two couples visiting Edinburgh for the first time and could not have found a better located apartment nor as well equipped. Plenty of room to relax in the living area and kitchen was equipped with everything we needed. Would have loved to enjoy the garden but weather was a bit chilly to do so. If we every return to Edinburgh, which is a lovely city, would definitely stay here again. Simply wonderful! Wonderful apartment, well equipped and comfortable. Met all our needs. Birgitta from Sweden, July 2018. This flat is very spacious and well equipped. 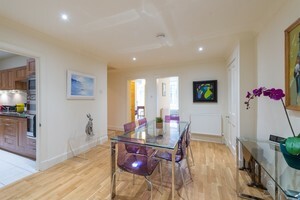 It is also very well located in a great area within easy walking distance to Princes Street. The host and local representatives went out of their way to make certain our stay was thoroughly enjoyable. 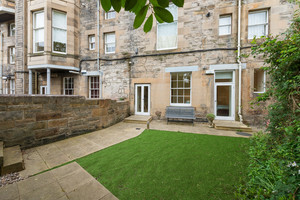 The location at the West End is very good with easy walking access to Princes street where all classes of transport is available and therefore the whole city and further afield. This part of the city has numerous good eating places which have to be tried. If you like shopping Princes Street has it all especially at this time of year with nearly every shop having "sales". The accommodation is very adequate and fulfilled the needs after a long day out.. Of course you have to be prepared to the "summer" weather. Location, Location and quality. A quite quality apartment just around the corner from all the sights. 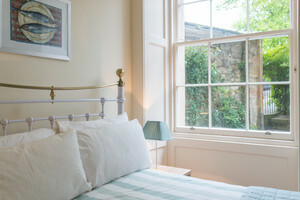 Easy walking distance from just about everything you would like to see in Edinburgh. Restaurants galore, laundry, and bus stops within a five minute walk. Apartment completely equipped, even down to umbrellas! The location is very good, with some walking to shopping & restaurants. Very quiet & bright, despite being on lower level of building. Extremely clean & modern for a fair price. 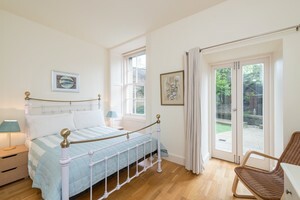 Great TV choices, including Netflix, & super comfortable mattresses in bedrooms with private green views. Magda, our contact person, was prompt & thorough in introducing us to the property. Only major drawback was that the clothes dryer wasn't working in the dual washer/dryer machine, & no laundromats were visible on the streets. Hopefully, this will be corrected soon, as the portable indoor hanging rack was inadequate. Other than this & a partially disabled front curtain (which was still closable), this is a beautiful choice of apartment in central Edinburgh! Comfortable and clean garden apartment in a great location. Appartment had everything we needed as a family of 3 and the great location made it easy to get out and about with a rambunctious little 2yr old. Good value. Thanks. We had a fantastic time in Edinburgh and the location of the apartment was superb for all the places to visit, the apartment was very comfortable and very well equipped and made our stay a pleasure, thank you. Tolle Wohnung, alles wie beschrieben und sehr sauber. Toller Service via App. Sehr central. Für gute Läufer ist alles ohne Verkehrsmittel erreichbar Dankeschön für den schönen Urlaub. An excellent find. 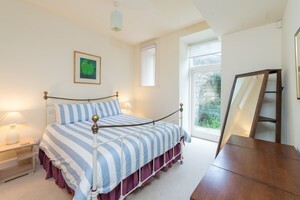 Within walking distance of city center attractions and peaceful riverside walks. A lovely apartment in a lovely area. Within easy walking distance of bars, restaurants and a great breakfast venue, the Caffeine Drip. Spacious accommodation with all the amenities you could need. Would love to revisit. Loved it! Everything was as it was said and seen in photos. We had a wonderful stay. Thanks Lorna and Magda! Everything as described, I had a late arrival and it was no bother. Great hosts and great apartment, highly recommended. Stayed at this Apartment 17/7/16 to 20/7/16. Apartment is very comfortable, clean and provides a high standard of accommodation. 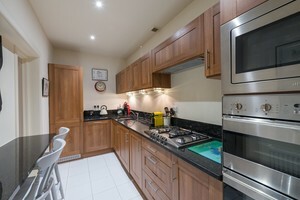 Location is quiet although within walking distance to attractions within the city. Would be happy to recommend to family and friends. We stayed here in May 2016 for 5 days. The place is well maintained, everything in the apartment works as promised, and the location turned out to be excellent, we were able to walk to all the sights while staying in a very peaceful neighborhood. Lorna met us at the apartment, made us feel at home, explained how everything works, and did not bother us afterwards. Overall it was a very pleasant experience - thank you Lorna! 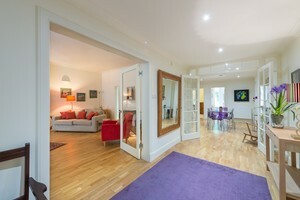 “Great location, with a lovely large living space. Rooms were well appointed with lovely bathrooms. Lorna was great to deal with. Highly recommend for a stay in Edinburgh!